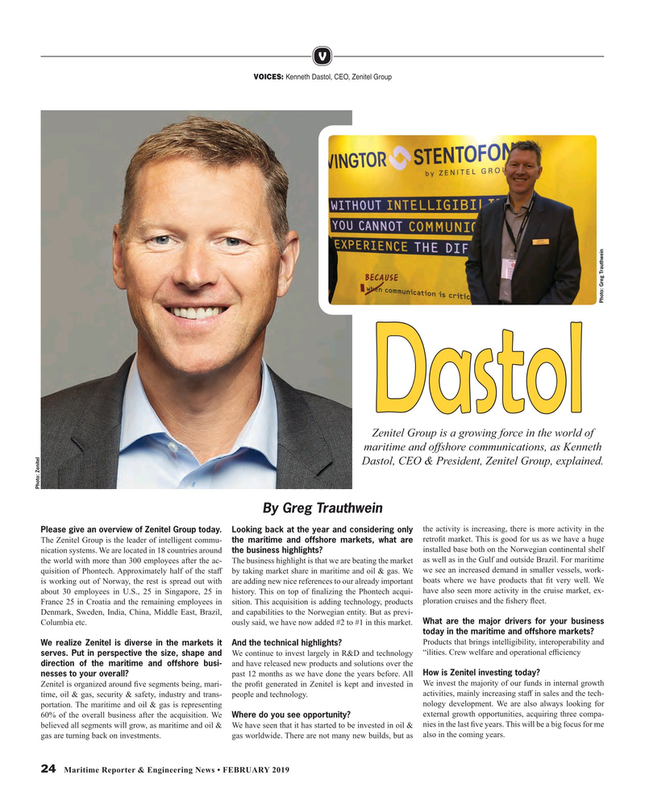 Dastol, CEO & President, Zenitel Group, explained. The Zenitel group is the leader of intelligent commu- the maritime and offshore markets, what are retroft market. This is good for us as we have a huge installed base both on the Norwegian continental shelf nication systems. We are located in 18 countries around the business highlights? France 25 in Croatia and the remaining employees in sition. This acquisition is adding technology, products ploration cruises and the fshery feet. Columbia etc. ously said, we have now added #2 to #1 in this market. What are the major drivers for your business today in the maritime and offshore markets? We realize Zenitel is diverse in the markets it And the technical highlights? serves. Put in perspective the size, shape and We continue to invest largely in R&d and technology “ilities. Crew welfare and operational efciency direction of the maritime and offshore busi- and have released new products and solutions over the nesses to your overall? past 12 months as we have done the years before. All How is Zenitel investing today? Zenitel is organized around fve segments being, mari- the proft generated in Zenitel is kept and invested in We invest the majority of our funds in internal growth activities, mainly increasing staf in sales and the tech- time, oil & gas, security & safety, industry and trans- people and technology. nology development. We are also always looking for portation. The maritime and oil & gas is representing external growth opportunities, acquiring three compa- 60% of the overall business after the acquisition. We Where do you see opportunity? believed all segments will grow, as maritime and oil & We have seen that it has started to be invested in oil & nies in the last fve years. This will be a big focus for me gas are turning back on investments. gas worldwide. There are not many new builds, but as also in the coming years.